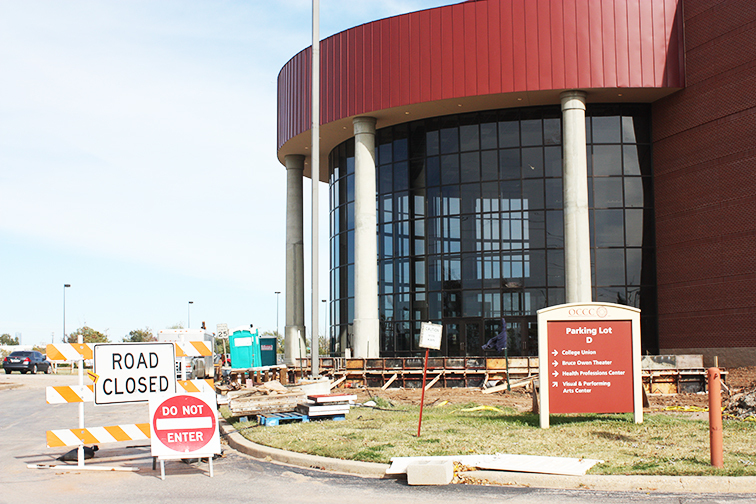 The date for completion of the new theater and related sidewalks, plaza and landscaping is now anticipated to be early in December, said President Paul Sechrist. The theater will seat 1,070 people. Construction includes an allée, a shaded walkway with lighting and landscaping leading from the main entrance of the Main building to the front entrance of the state-of-the-art Visual and Performing Arts Theater. A tour of the facility reveals its grandeur. The sheer volume and open space are evident when walking through the atrium with light streaming in from the three-stories-tall glass panels that define the west wall. Funding for the $21 million theater comes from a variety of sources — with student fees contributing $8 million toward the total cost. In 2007, students in The Leadership Council voted in favor of paying a $3 per-credit-hour increase to the facility fee for construction of the theater, said John Boyd, vice president for Business and Finance. Bardeguez said student support was critical in getting the project moving almost eight years ago. This was an important time for OCCC to accomplish a dream it had for many years, Bardeguez said. Bardeguez expects the theater to be a training facility for students in the performing arts and hospitality fields. Boyd said the allée, or walkway, is expected to cost a little more than $1 million, all of which came from the South Oklahoma City Area School District building fund levy. • Section 13 Offset Funds: $2.8 million. Boyd said Section 13 offset funds are provided by the Legislature for campus maintenance and construction. • Master Lease Real Property Funds: $4 million. Boyd said this fund is a financing program under which the Oklahoma State Regents for Higher Education may finance acquisition of or improvements to, or refinance or restructure outstanding obligations for real property. • Auxiliary Funds: $3 million. Boyd said auxiliary funds include Bookstore revenue, facility fees ($3 per credit hour of which was used to support the $8 million bond resolution approved by students), the student activity fee, Arts Festival, Food Services and other activities of OCCC that are not related to education and general expenditures. • Private Donations: $1.9 million. • South OKC Area School District Ad Valorem: $1 million. A portion of ad valorem, or property taxes, paid by South Oklahoma City residents is designated for OCCC. Sechrist said the theater space also will include the Inasmuch Art Gallery. Displayed art will be for sale and will serve as a fundraiser for student scholarships. The first exhibit in the new gallery will feature the work of Desmond Mason, an artist with Oklahoma connections. The opening for the art show will be the evening of Saturday, Jan. 18. Art will be outside as well as inside. Private funds have been raised to create and install a large outdoor sculpture that will be located in the plaza near the front of the building, Sechrist said. The sculpture, “Crescendo,” was designed by local artist Colin Rosebrook. It will be unveiled at the plaza-naming ceremony late in the afternoon on Thursday, Jan. 16, according to an email from Sechrist. Project Manager Larry Barnes said construction took a little longer than expected. “You can’t rush this,” Barnes said. “You can push in early stages of a job but when you get down to the final finishes, you don’t want to push those. “We need to make sure it is done right. My job is for quality assurance during this process,” he said. Sechrist said once the building is finished, move-in will begin. “It will take a few weeks to complete the installation of furniture and equipment to ready the theater for events,” Sechrist said. The formal dedication ceremony will be a part of the Spring Semester Prep and Planning Week, when professors return to work after the new year. The ceremony will be held at 1:30 p.m. Tuesday, Jan. 14, in the lobby of the theater. “We are planning tours of the facility directly following the ceremony,” Sechrist said.